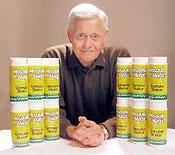 Meet Mike Spargo, The Man Who Created Mosquito Magic! The Driving Force Behind Mosquito Magic. For the past 15 years, Spargo Enterprises has tried to put a breath of fresh air into the flying pest repellent marketplace. All natural, simple, completely safe, non-toxic, reliable, and environmentally friendly, are what Mosquito Magic and Spargo Enterprises are all about. That's what we strive for.....To make life easier and safer. Mosquito Magic is a perfect example of "easier and safer". Just think, no poisons, no toxins, no danger to children, no danger to older adults, no chemicals building up in your system. Just great "all natural" protection from flying pests in multiple easy-to-use delivery methods. Clip it on for individual protection; sprinkle it in and around outside areas for small or large gatherings, or wipe it on your exposed skin surfaces and go. Based in Gastonia, North Carolina, our sales and customer service representatives welcome any comments or questions concerning any of our Mosquito Magic® products. Thank you for taking the time to visit our site. We hope you will enjoy using Mosquito Magic®, the world's finest all natural repellent that's field tested and proven to work. Got a question about Mosquito Magic? Email Us! *Please note: Mosquito Magic is not available for sales or shipment to residents of Virginia.